We are so proud that the Turtle Tots franchise loves SwimFin and uses them at a majority of their locations. We asked Turtle Tots what they love about SwimFin and how they are used throughout their programmes. Paula Stewart (Harrogate, York, North East and South Leeds) has shared with us her thoughts! 1) Why did you choose to use SwimFin in your lessons? To aid independent swimming without restricting arm movement for the child traditionally seen with the use of woggles and arm bands/rings etc. 2) What benefits have your students gained from using SwimFin? For the the younger students we have seen earlier confidence in wanting to swim independently without parent assistance and for our older students (3 years to 7 years) it has helped with their body positioning in the water and has also aided in giving a bit of support/security for the child if they feel tired whilst undertaking strokes skills. 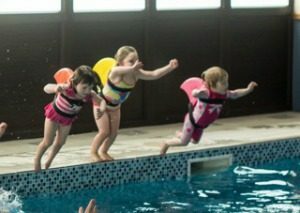 SwimFin has also been a pivotal safety aide for children who are just entering the transition to no parent in the pool classes. 3) What do the parents think of SwimFin and their child’s progress? We have found that parents really enjoy seeing their children progress quite quickly with the aides, but we also make sure that the child doesn’t become too dependent on the SwimFin and encourage free swimming during classes after the SwimFin has been worn and that’s where parents see the most progress. We also encourage parents purchase the SwimFin for holiday purposes from a safety aspect. 4) What creative ways do you use SwimFin within lessons? The games and actvities are endless! Here are a couple of activities we do: To get the little ones upright and moving at the start, the little ones have a short woggle with a dive ring (the bell) on the woggle as handle bars and we sing “I like to ride my bicycle song” so they use a cycle action kicking movement and go round in circles, ring the bell stop at the traffic lights etc. 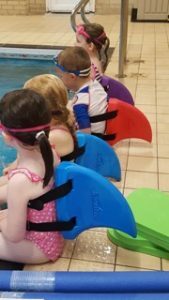 Thank you to Turtle Tots and their fabulous Little Sharks who are putting their SwimFins to great use! Pop over to visit their website to find a location near you!